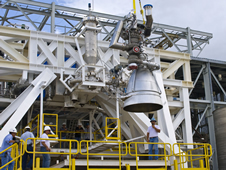 An AJ26 engine on a test stand at NASA Stennis. WASHINGTON, D.C. (Sen. Cochran PR) – U.S. Senator Thad Cochran (R-Miss.) today said the agreement signed today between the State of Mississippi and the commercial space company SpaceX bodes well for future job growth at and around NASA’s John C. Stennis Space Center in Hancock County. Cochran commended the accord which will involve SpaceX investing in the E-2 test stand at Stennis to support engine research, development and testing of the firm’s Raptor methane rocket engines. The agreement, signed by Governor Phil Bryant, also involved the Mississippi Development Authority, Hancock County Port and Harbor Commission and NASA. “I appreciate all the good work put into reaching this agreement, including the efforts of Governor Bryant, the Mississippi Development Authority and local leaders in South Mississippi. It is proof that we have a team in place that helps make Mississippi a great place to do business,” he said. As a long standing member of the Senate Appropriations Committee, Senator Cochran has worked hard to ensure that Stennis Space Center has the assets necessary to support both government and private-sector missions. In recent years, Cochran has supported appropriations measures to upgrade aging Stennis infrastructure, including resources for the E-complex that SpaceX will be further outfitting for methane rocket experiments. In addition to his work on the E-complex, Cochran authored a FY2012 appropriations provision requiring NASA to examine and report on the condition and necessity of the massive B-2 test stand, which is used by NASA for large rocket engine systems tests. That report elicited a NASA decision to request $12 million in FY2012 appropriations to initiate the rehabilitation and reuse of the existing B-2 test stand to support the NASA Space Launch System (SLS) program. The NASA report also identified a need for further upgrades to the B-2 stand and led to Cochran successfully securing $168 million in FY2013 funding to keep the B-2 test stand upgrade on schedule for the development of SLS. Cochran was also closely involved in crafting the 2010 NASA Reauthorization Act, through which Congress directed the commencement of the SLS program to replace the Space Shuttle program. Good spot. So looks like I had it right and wikipedia has it wrong. Anyhow, a lox methane engine would still manage higher performance and would likely also have improved longevity due to cleaner burning and less sooting. Also generating and storing CH4 on Mars (and Earth) has a much lower energy footprint compared to LH2. Also, being denser, the overall vehicle is smaller and therefore cheaper. I like your F4 reasoning, but one fly-in-the-ointment is the loss of a central engine for landing. Unless it’s a tri-web or how about an F5 with a quadro-web – surely the name of the engine arrangement is the most important thing. Seriously though, HyperJ’s suggestion is the most likely bet – a new engine for a new vehicle. That said, there is wide acknowledgement that methane is cleaner than RP1, which is a useful trait for a reusable booster engine. Another suggested factor in all this, that I read elsewhere, was that the creation of a test stand at Stennis (with money from NASA and Mississippi) also gives the opportunity and some motivation for other companies to develop methane engine tech – part of a nudge to the industry to move to methane. In the longer term, when thinking about spaceship construction (i.e. module docking) on-orbit and fuel depots and of course Mars, all these would benefit from a fuel with some degree of storability, and LH2 doesn’t easily qualify. Yes, it is a serious issue and I don’t think anybody is disputing that. Then again, rocket engines are generally operating at the extreme limits of almost any mechanical system that can be conceived and is one of the reasons why getting into space is so bloody difficult in the first place. I have no doubt that SpaceX engineers (the folks that really matter on this issue) have reviewed the engineering data from that burn through and are trying to remedy the situation by trying to find why those sensors you are concerned with failed or what possible sensor could potentially added to the system. Then again, the Merlin 1D engine is a major redesign of the engine that failed, so such changes may not even be applicable. Of course one of the reasons (out of many) why the ability to recover the 1st stage is so incredibly useful is that you can also look at failed engines like this and have the engineers tear down that engine as well as engines that worked properly in the same environment to figure out what worked and what didn’t. The only other people that really matter on this issue besides the engineers is potential customers and insurance underwriters of payloads that may fly on SpaceX vehicles. Hopefully they’ve been given the proper information from SpaceX that they need to make their evaluations on this issue as well. No, Bob, he means there is no exterior aerodynamic fairing. Having a quick look around the web, it looks like a LOX Methane engine would have an ISP of around 10s more than a similar engine running on RP1. I agree with the problem of landing if you have four engines, arranged in a square. I think that you could shut down two, but even so, you would need to be able to deep throttle the engines, possibly down to as low as 30%. I just keep thinking that the sweet spot in the satellite launch market seems to be around the 8tons – 15 tons to LEO range. This is already served by F9 and explains why Spacex has such a full manifest without many FH flights. I also think that the main reason that Spacex are moving to Methane is not for power increase, but for increased reusability. I think that Raptor will be too powerful at 300tons for the F9 second stage. Hence if Spacex are developing reusability with the F9, which we have seen from their attempt to recover the first stage on the last flight, and if F9 is positioned at the sweet spot in the launch market, then it seems to me that any new rocket, would be a replacement for F9, rather than a bigger vehicle. Spacex would not want to fall into the trap that Ariane 5 has done, of being able to carry around 20tons to LEO and then needing a pair of satellites on every launch, because basically, the rocket is too big for much of the market it serves. I also think that Spacex will want to preserve commonality of components between F9 and FH. So why keep the RP1 engines on the F9 first stage if that is going to be reusable, and the methane engines are more reusable than M1-D? I suggest you write Elon a letter or email then and tell him you are not a fan of his rocket. I’m sure he’ll get right on it. There must be another way to land a big rocket with a small engine. 4) Methane is much easier to handle than LH2 – and that applies to Earth, orbit and Mars. 8) Storability not only applies to fuel depots and orbital loitering (i.e. tugs), but also to landing a significant mass on Mars after a 6-7 month journey. Well that ain’t gonna happen. All in all, I don’t see (this) Raptor being a replacement for RP1 Merlins on F9 class boosters. 3) Vehicles to get to Mars….and back!. I sincerely believe that lifting sats to GTO is a short-term problem. No, you’re both right. The Merlin Vacuum and the Merlin 1D are not exactly the same. The vacuum version has a longer nozzle attached to extract extra performance in vacuum. But the key point is that extra long nozzle makes it so that it can’t operate at sea level; the instabilities produced can literally tear an engine apart. So that is why engines with shorter nozzles are used for launch from sea level on up, though this reduces their vacuum performance. But the comparison to the Russian engines was to Russian engines with short nozzles. Then a valid comparison would be to the Merlin 1D. In that case the Russian ones do have better Isp. Another way of saying this is that if you gave the Russian engines extra long nozzles so that they were optimized to only work in vacuum, then they would also have a higher Isp than the Merlin Vacuum. By the way, a metric that the Merlin’s of either type do have an advantage in over the Russian ones is thrust-to-weight ratio. For the Merlin’s it’s in the 150 to 1 range, higher than any other kerosene engine. That is why SpaceX is building a larger engine to go to making a super heavy lift launcher, larger than the Falcon Heavy. I presume that it is to be used for their Mars missions. I would like for it also to be used for their F9 and FH rockets. You can use a “small” engine such as the Merlin for small rockets. For large rockets, you should produce larger engines..
No, need since he is already upgrading to a more powerful engine. If you have done the math as you claim, then you would know he would not be landing on that engine unless it DEEPLY throttles, has an idle mode, or can exhaust the turbine drive gases directly out a bottom nozzle with the fuel flow shut off. I suspect that is what these experiments will assess properly. You can either get on the horn and inform Mr. Musk of your breakthroughs in brain fart engineering, or you can publish. Everyone here is being very patient with you Robert. It was just explained to you, the engine didn’t burn through, it depressurized from some kind of manufacturing defect. Even if it did burn through to the outside before sensors shut it down, there is nothing out there to burn, just air. That’s what the Kevlar panels are for, to protect the rest of the internal plumbing from burn throughs and other explosive failures. Rockets and rocket engines fail all the time, Robert, it goes with the territory. By high flight rates of numerous engines he can gain enough experience to prevent those kinds of things from happening, and recover from them when they do. And he can also you the detuned thrust of a single landing engine to land the vehicle so that his engines can be then examined for defects. Win – win all around, Bob. I wish you luck with your rocket. who says that he is? Just because he is building a new engine, does NOT mean that he will be replacing the merlins with it. The fact that he speaks about the MCT every so often, hints at the fact that Falcon 9 and H will continue on their same path. it was a major failure. i’m not arguing that at all. it was not, however, an explosion or a disintegration, as you have repeatedly claimed. It’s not my idea. It is what SpaceX is doing.